World news #2 – IRISH Voters to decide: “Pro-life” or “pro-choice”? (by Paul Hannon, The Wall Street Journal) – [The “Save the 8th” campaign held the All Ireland Rally for Life in Dublin on Saturday. 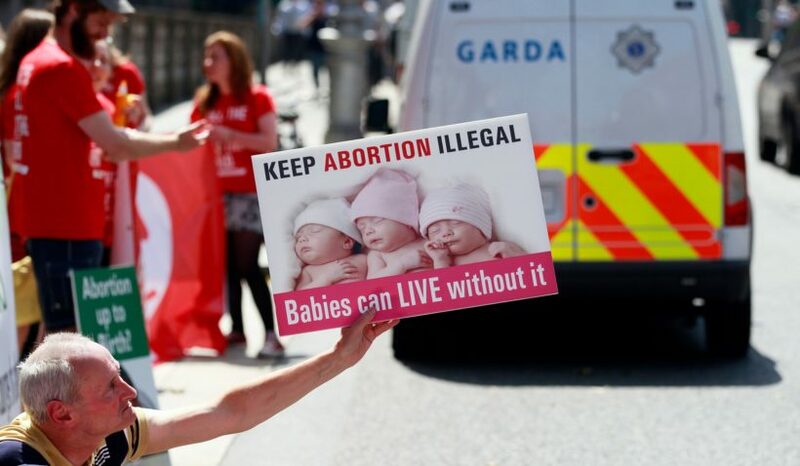 Irish citizens will decide on May 25 whether to repeal the 1983 Eighth Amendment to the Irish Constitution, which grants an equal right to life to an unborn baby and its mother. The proposed reversal of the law would allow unrestricted abortion up to twelve weeks into pregnancy.] [Save the 8th supporters] held their last major rally two weeks ahead of a vote on [whether to reverse the constitutional amendment which bans abortions in Ireland] – one of the few European countries that still outlaws it. “We need to boldly speak up for the eighth amendment in these vital days,” said Cora Sherlock, one of the campaign’s leaders, to a crowd waving banners and balloons in bright sunshine. Ireland is among a small handful of European countries that outlaw the procedure. Northern Ireland, Poland and Malta also outlaw abortion in all or most cases. Opinion polls consistently point to a majority in favor of lifting the ban. A late April poll conducted by Ipsos Mori found 47% of potential voters backed repeal, with 28% opposed and more than 20% undecided. The poll recorded that the gap between the two sides had narrowed since the government—which advocates a lifting of the ban—said that, if the ban is lifted, it would propose allowing women to have access to abortion only up to 12 weeks of pregnancy in most cases. Women could terminate their pregnancies later in certain limited circumstances. [British law states that abortions are permitted up to 6 months (24 weeks) of pregnancy if the continuance would risk the “physical or mental health” of the woman or her children. Approximately 20% of all pregnancies in England currently end in abortion. No statistics were given as to the number of women who chose not have abortions because the 8th amendment gave them time to think about their decision.]. 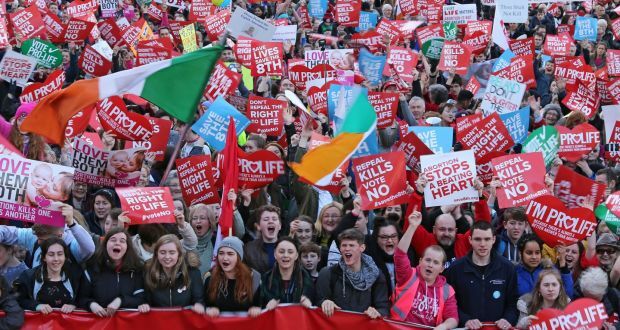 The referendum has resonated deeply in a country that is still overwhelmingly Catholic [and pro-life, although] the number of Irish who said they were Catholic went from 93% in 1981 to 78% in 2016. …The [pro-life] campaign also suffered a setback when Google announced Wednesday that it would stop carrying advertisements related to the referendum from May 10. The internet companies decided to act after pro-abortion lawmakers who favor repealing the ban [complained] that some advertisements were being placed by unidentified overseas groups…. b) What is the 8th? c) Why has the number of voters who would repeal the ban and make abortion legal risen recently? d) Why did Google stop carrying advertisements related to the referendum after May 10? e) Why don’t those who support ending the ban on abortion need Google to campaign, according to the pro-life supporters? f) Read the “Background” and check out the links under “Resources.” What is your reaction to Gavin Boyne’s story? Do you think it is relevant? Explain your answer. 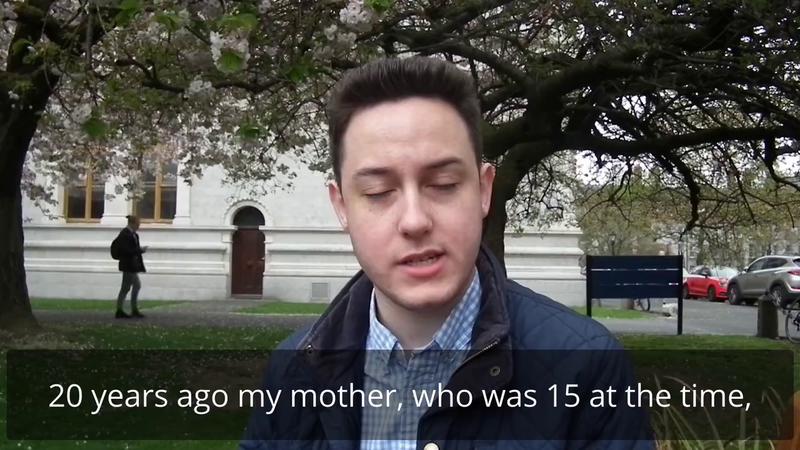 To cheers, student Gavin Boyne (20) said he wanted to express his thanks to those in the crowd who had campaigned for the insertion of the amendment into the constitution in 1983.